These sour melon rings are so fantastically fruity and delicious! 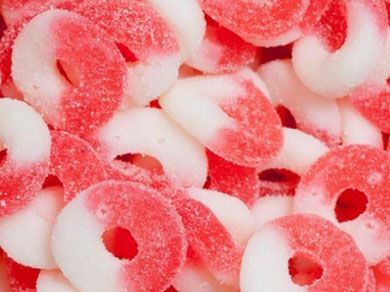 With over 240 gummy rings in each bag, there's plenty to share with family and friends (if you want to, that is!) These have a slightly different texture on the top and bottom, with the top being more of a classic jelly gummy, and the bottom being of a softer, 'marshmallow-like' consistency. The 2 sides pair perfectly for the ideal chew, making this melon candy a popular pick! Perfect for Valentine's Day, baby showers, and wedding candy buffets!